As a family physician in Stoney Creek for more than 50 years, Dr. Bob Kemp had thousands of patients. Yet he still remembers the one who spurred his passionate crusade for quality care at the end of life – a crusade he will continue in perpetuity, thanks to a fund with Hamilton Community Foundation. The patient was deaf and lived alone. With no support at home, and nearing the end of her life, she was in and out of hospital five times. Had a hospice been available, she would have spent the end of her life in a home-like setting, looked after by sensitive staff and volunteers trained in hospice palliative care. Forty years later, the Dr. Bob Kemp Hospice offers an interdisciplinary team of professionally trained volunteers and staff who assist in caring for individuals with a life-threatening or terminal illness. Incorporated in 1994, the Hospice now has a staff of four and a dedicated corps of volunteers. Volunteers receive 30 hours of training to allow them to offer supportive care to their clients at home, to offer respite care to family caregivers, and to support clients and their families in hospital and long-term care settings. They also provide support and understanding to the bereaved after the death of a loved one. In 1998, hoping it could be converted to a community residential hospice, Dr. Bob and his wife Mildred generously donated their home to the Hospice Foundation. However, the cost of renovations proved prohibitive and the building is now used for Hospice programs and offices. Dr. Bob and his wife Mildred, along with many volunteers and supporters, continue to raise funds toward their goal of a free-standing residential hospice. In addition to devoting themselves to the Hospice, the Kemps are helping to fund ongoing training in palliative care for practicing family doctors through the Canadian College of Family Physicians. And in 2002, the Dr. Bob Kemp Hospice Foundation became one of several partners launching the new Palliative Medicine Residency Fellowship Program at McMaster. Bob and Mildred Kemp have been partners through 62 years of marriage and a 9-year courtship that spanned Dr. Bob’s medical training and RCAF service in the Second World War. They moved to Stoney Creek when the village population was just 840. Their contributions to community life since then – through Rotary, their church, the Red Cross, Cancer Society, and scores of other volunteer organizations – have been extraordinary. 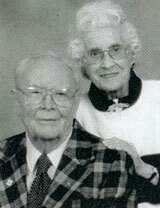 Mildred was recognized as Stoney Creek Citizen of the Year in 1969 and Bob in 1976. They continue to be active volunteers today. The Kemps have established two funds at Hamilton Community Foundation and were among the first donors of company shares. (Mildred worked for Bell Telephone before her marriage and took advantage of the employee stock option plan.) “I helped on a medical advisory committee of the Hamilton Community Foundation some years ago,” says Dr. Bob, “and I saw and admired how well the Foundation handles things. They are very knowledgeable, nice people. I know that through the Foundation, our daughter and others will be able to continue this work after we’re gone.” The Stoney Creek Health Fund is an open fund at HCF to which anyone may contribute. Dr. Bob remembers a University of Western Ontario medical school professor who, more than 60 years ago, would invite students to his farm outside London. “He understood the art of medicine,” says Dr. Bob. No doubt there are hundreds of people in this area who think of Dr. Bob in the same way.